Rockwool cubes are commonly used for indoor plants, creating beautiful organic material in soilless areas. 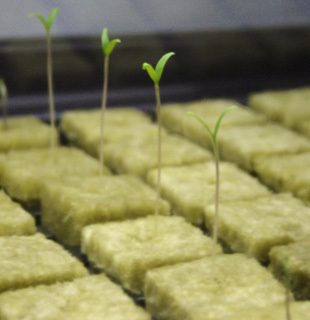 Rockwool doesn’t just come in cubed form, although this is the popular option for seedlings. It’s also available in slabs and as loos chunks. Here’s a look at everything you could need to know about Rockwell cubes and using them for your indoor planting. Rockwool is actually a brand name. Its generic name is rock wool, but all is created in similar ways. Rockwool is made up of sand and rock. Steam is jetted through limestone, siliceous rock, and other forms of molten rock or slag to create an ideal area to grow indoor plants. The molten rock can also be spun at high speeds to also create it. Think of the spinning a little like spinning to make cotton candy. It’s then shaped into various forms, with cubes being one of the most popular when it comes to indoor planting form seed form. Although, it is popular for some other reasons, including for insulation and fireproofing. The material is extremely absorbent for long periods of time, making it ideal for young plants that need plenty of water to grow. However, that water doesn’t sit stagnant. The material allows for the air to circulate around the roots, making it much easier for the seeds to get all the nutrients necessary. On top of that, it’s reusable, making it perfect for those who want to protect the environment. It’s also sterile and lightweight. The main downside is the high pH level it has naturally from the rock. The cubes (and other forms) need to be treated to lower the pH levels so they can grow plants properly. Do bear in mind that because it’s absorbent it can be a problem in some areas of your home. You’ll want to avoid basements and other areas with high moisture levels. The fibers taken in any and all moisture, but this can lead to some mold growth if in consistently high moisture areas. Rockwool is an abrasive material. One of the first things you’ll want to do is soak the Rockwool before planting it. Without soaking, the material can release microparticles that become irritable to those around it. Soak the Rockwool in treated water (see below) for up to an hour to stabilize the Rockwool pH level and reduce the microparticle release. To germinate your seeds, you’ll need to test the pH of your water to see what level it’s at. Most water coming from the material will show up green in a pH test, which means it’s sitting around 7-8. This is too high for plants, so you’ll want to add some lemon juice to your water that’s added to the Rockwool to reduce the pH to around 6. Anything below pH 5 will damage the fibers within the Rockwool. You can add more water to bring it back up. Place your seed into the hole that is already made in the top of the cube. The amount of seeds will depend on the type of plant or herb you’re growing. Follow the direction on the plant packet if you’re not sure, but herbs will usually need 6-8 seeds and most vegetables and plants will need 1-2 seeds. Then place the cubes into the nursery tray and sit them in an area that reaches between 70 and 80F each day. Every 1-2 days you’ll need to water with treated water (to get the alkalinity down again), and most will start sprouting within the first couple of days. You should see roots show through the bottom of your cubes. When the plants form 3-4 leaves and have grown to about 3 inches in height, you can then transfer the plants to your soil. Transferring to the soil is relatively easy and you get to keep everything within the cube. Make sure the hole you dig in your soil is big enough for the whole cube. The hole should be deep enough to cover the most of your cube, with just a little sticking out of the top—the whole cube should never be completely covered to avoid puddles forming and rotting the root. Make sure you water straight away with the treated water. Now you can start the growth of your herbs and plants indoors. This is perfect for those who suffer from harsher climates and those who want to give the seedlings the best start to their lives.